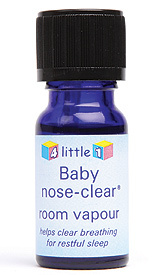 Baby Nose Clear is a range of products by 4 Little 1's specialising in relieving baby's colds by clearing a runny or blocked nose. Babies seem to get runny noses a lot and get blocked up meaning sleeping and feeding can become very difficult,a stressful time for both mummy and baby. After reviewing the Vapour Ring by 4 Little 1's and seeing how fantastic it was, I was eager to try more of their products so when I was asked to review the Room Vapour I jumped at the chance. The Room Vapour is 100% natural and the pure essential oils are gentle, they help decongest and relax baby to help get a restful nights sleep. It is blended with lemon, for its antibacterial properties and refreshing smell, tea tree, a known fighter of infection and is excellent for fever, coughs, colds and flu, sinusitis, bronchitis and asthma, and pine, for restoring strength after illness. To use, simply add a few drops to a bowl of warm water and place in babies bedroom (out of reach) and let the vapours take hold of the room. Alternatively you can add a few drops onto a damp cloth and place over a warm radiator and again this warm air will allow the vapours to fill the room and ease cold symptoms. With the oil being so gentle, you can also add a few drops to the Inhaler Dummy. I love the scent of the Room Vapour and sometimes just place a cloth over our bedroom radiator just so it smells nice too and I guess that will always help keep nasty colds away at the same time. When we received this Thomas actually had a cold and Charlie was starting to show signs of getting one too so I took that opportunity to try it out. First of all I put a few drops into a bowl of warm water and placed it in Charlie's bedroom about an hour before I put him to bed so it could spread out across the room. With Thomas's room, I didn't use a bowl of water as he would end up tipping it out in the morning, so I got a damp cloth and poured a few drops of the Room Vapour on to it and then put the cloth on his radiator. Both boys slept a lot better and apart from Charlie waking for some milk, we had a peaceful nights sleep. You can purchase the Room Vapour from 4little1's website and from Boots. 4little1's can be followed on Facebook and on Twitter. I'm sure everyone has heard of pH values. To be honest it confuses me a little when it comes to skincare. I never knew that our skin was slightly acidic and has a pH value of 5.5. The acidic pH value of the surface of the skin wards off pathogens that cause disease. Also the acidic pH value also stabilizes the skin's function as a barrier. Having a pH of 5.5 prevents water loss from the inside and penetration of pollutants or irritations from the outside. Changes in the pH value of the skin weakens the protective function of the acid mantle. This can cause skin infection, dehydration, skin irritations and allergies. 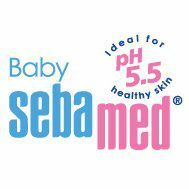 Unlike conventional soap products which can have a pH value of around 9-11, Sebamed has a pH value of 5.5 which protects the skin's natural balance. The company was founded in 1967 and is the World leader in medical skin care that is known and trusted in over 80 countries. It has been developed in cooperation and recommended by dermatologists and supported with clinical testing. Ideal for cleansing and care of fine hair and delicate scalp of babies and children minimizing the risk of dryness or irritation. 100% soap-free, mild body cleansing of the delicate baby skin, making it smooth and soft, minimizing the risk of dryness or irritation. The efficiently moisturising and emollient complex is rapidly absorbed for gentle protection to safeguard baby's delicate skin against dryness. Excellent protection of the skin against cold weather, prevention of nappy rash and stimulation of the healing process. Prevention and rapid relief of diaper dermatitis, protection against aggressive substances which could cause inflammation of baby's delicate skin. Thomas and Charlie love playing in the bubbles from the bubble bath, there is a very generous amount of bubbles just from one little squirt which also smells really nice. I usually have a fight on my hands to get Thomas to let me wash his hair but because the bottle is shaped so Thomas can hold it easily he enjoys pouring a bit onto his hand and then rubbing it onto his hair himself, I think he's going through the 'wanting to be independent' stage so this is great for him. The scent from the shampoo is so beautiful, not overpowering but also not too subtle that it wears off straight away. It actually stays around long after the bath and I could even smell it the next day when walking Thomas to nursery which was a pleasant surprise. The cleansing bar is also very sift and gentle and produces a lot of foam when rubbed through hands to make washing very easy. The baby lotion again has the same distinctive scent and is very mild on the skin, easy to rub in and makes the skin very smooth indeed. The cream is much thicker and I like to use this on knees and elbows. In the winter months I can see us using this a lot more to protect against the cold weather. We luckily haven't had to use the diaper rash cream yet but I'm sure if it's as good as the other products in this range then it'll fight nappy rash no problem. You can buy Sebamed from their own website, from Amazon and from a large range of Pharmacies (too many to mention).